This is a Wordpress site for Harrogate based Face Group using Isotope, David DeSandro's jQuery extension. 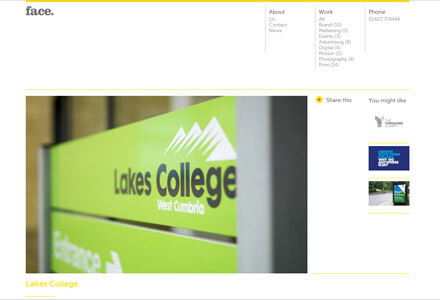 The template produced handles portfolio items in a grid system which allows entries to be formatted to up to ten columns and rows, although they've decided to standardise the look by keeping each entry the same on the main home page. Face Group are a Harrogate based media agency who specialise in print campaigns for the higher education sector. They have a huge body of work so they wanted a site that could showcase that work in an attractive and accessible way, and be simple and quick to update. Neil Holroyd (who also designed this site) created designs and we decided to use WordPress as the platform because we do a lot of WordPress work together and he is used to updating the back end (and used to the way I build WordPress sites, so he knows how I set them up and could get up and running straight away).